The Raritan River has a rich history, which includes strong ties to Rutgers University. A number of entities from across the university are collaborating to transform the Raritan Basin into an interactive field laboratory that enhances the student experience and addresses real-world concerns of regional stakeholders. Three related initiatives spearhead Rutgers’ commitment to the Raritan — the Johnson Family Chair in Water Resources and Watershed Ecology, Rutgers Raritan River Consortium (R3C) and the Sustainable Raritan River Initiative (SRRI). Collectively, these initiatives facilitate an interactive Raritan-based field laboratory for faculty, staff and students across multiple academic disciplines. Externally, these initiatives premise the university’s engagement with external partners including watershed organizations, federal, state and local governments, non-profit community based organizations, businesses and other community members. External efforts include education and outreach to better integrate Rutgers’ science and research into planning and decision-making and coalition building to benefit regional planning approaches. 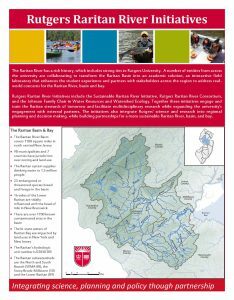 This website provides visitors with information about the Raritan Basin and Bay, further detail on the Rutgers Raritan River initiatives, including efforts of Watershed Partners — the Sustainable Raritan River Collaborative, and news and events that relate to the Raritan region.